At the end of a narrow lane, half a mile from the horrendous A140, is one of the Churches Conservation Trust's Suffolk jewels. What strikes the eye first is the step gabling at the eastern ends of nave and chancel. And then above them, simply one of the loveliest towers in all Suffolk. The 15th century flintwork rises up its sides, and then opens out on three faces into the Marian monogram, with letters around, including the initials of Ave Maria, Gratia Plena: Hail Mary, full of grace. A reminder of Seely Suffolk, and that this country was often described as Our Lady's Dowry in medieval times, before the Tudors went all protestant on us. The bell in this tower is inscribed VIRGO CORONATA DUC NOS AD REGNA BEATA: Lead us, Crowned Virgin, to the Holy Kingdom. This refers to the fifth glorious mystery of the rosary, like the tower donor inscription at Helmingham. At close quarters, the 15th century south porch and south chapel appear all as one, as at Sudbury St Gregory. But, from a distance, this is clearly not the case, and the chapel is almost a truncated aisle. It was probably tucked into the space a little after the porch was built. It is reminiscent of Newbourn, where the south chapel hugs a south tower. St Mary is open every day, and you step down into a plain, simple interior, bearing considerable marks of each of the last three centuries. Firstly, the 18th century gallery, a rare survival. The organ fits into it beautifully, and is very characterful.Secondly, a good 19th century restoration by E.F. Bishopp, also responsible for the restoration at Ipswich St Nicholas. Roy Tricker observes that the cost was borne by the vicar of the time. The chancel here is Bishopp's masterpiece, particularly the roof, with St Peter, St Paul and the four Evangelists in alcoves in the wallposts. St Mark turns slightly towards the east, while the other five peer back into the nave. The legacy of the twentieth century is rather more mundane, Munro Cautley's set of benches. The crocketting on their backs echoes that of the north and south walls of the nave; but I always think with Cautley that you can see him observing the letter of the Middle Ages rather than its spirit. An even greater shame is that he was replacing a set of 18th century box pews, which must have looked delightful here. But above them is one of Suffolk's finest double hammerbeam roofs. Its carved figures have had their faces cut away, probably by 17th century puritans. Earlier in the 17th century, Gilbert Mouse died in London, and was buried in St Margaret, Westminster. However, he came from this parish originally, and a delicious memorial of the 1620s remembers him on the north nave wall. In alabaster and slate, with skulls, cherubs, bones and hour glasses surrounding an inscription, it records his rise to be servant to three Lord Chancellors. After his death, he left money to this parish to maintain the highway (so that's who we have to blame for the A140!) and also for distribution to the poor on St Thomas's Day and Good Friday for ever. The 15th century font is rather unusual; lions and buttresses support the stem, with angels under the bowl in the best East Anglian tradition - although this font is really in excellent condition. The emblems carved in the 8 panels include a crowned Marian symbol, a crucifixion with Christ flanked by Mary and St John, instruments of the Passion about a heart, and a Tudor rose. There is also another crowned Marian M, but this appears to have been recut more recently. It is probably from the same workshop as that at nearby Earl Stonham. The 18th century has left the kindest legacy here. The vestry in the south-west corner is delightful, the glass panes in the lattice window making it look as if it might be serving double-purpose as the snug bar of some old country hotel. Given the simplicity of the building and the elegance of the gallery, you can't help mourning for the box pews which Cautley removed. It was inevitable, I suppose, that of the three Stonham churches, this would be the one to go. Earl Stonham and Stonham Aspal are both sizeable churches in sizeable villages. That at Earl Stonham is one of Suffolk's most interesting churches, if not as beautiful as this one. Today, this parish is part of Earl Stonham parish. 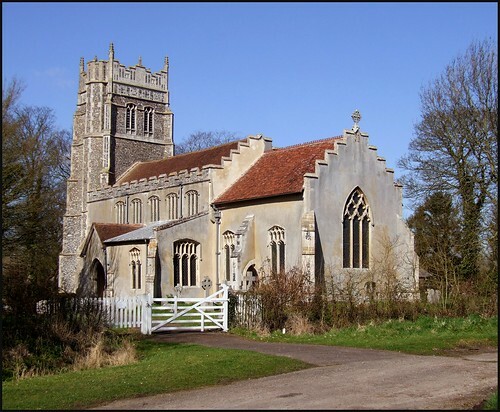 Before 1970, Stonham Parva was in a joint parish with St Andrew, Mickfield, across the A140. That, today, is also redundant, albeit now restored to use for Christian purposes; a large medieval parish then, with neither of its churches working anymore.